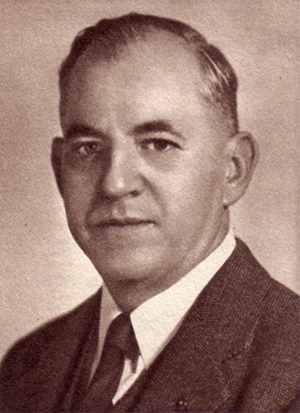 Arthur M. Harding was the first Arkansas-born president of the University of Arkansas. He attained his bachelor’s degree from the University of Arkansas before earning his master's and doctoral degrees from the University of Chicago. He returned in 1904 to teach mathematics and astronomy in the university’s preparatory department and became registrar in 1916 and director of general extension three years later. He also lectured across the country about basic astronomy before literary and women’s groups. Starting as president on the eve of America’s entry into World War II, Harding put the university at the disposal of the war effort. The university’s schedule shifted to quarterly semesters, temporary barracks were built and instruction was recalibrated to military training. After the war ended, enormous changes were needed to deal with the return of veterans and reorientation of the university’s academic programs. Near the end of his tenure, Harding’s health began to fail, and he relied increasingly on other administrators and the board of trustees for day-to-day operation of the university. This had the effect of fostering a larger centralized administration on the university campus, a change that was probably overdue. He resigned in 1946 but served until early 1947 until a new president could be hired. Personal: Harding was born in 1884 at Pine Bluff, Ark. He married Edna Nance, and they had two children. He died Dec. 24, 1947, at Fayetteville.